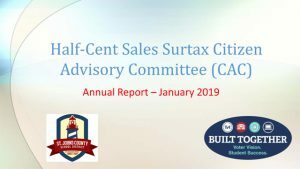 The Resolution the St. Johns County School Board adopted in order to place the half-cent sales surtax referendum on the ballot called for the formation of a Citizen Advisory Committee to monitor and advise the School Board and the community as to the expenditure of the sales tax proceeds. The School Board appointed 15 Advisory Committee members on February 9, 2016 to serve in staggered terms. The Advisory Committee meets quarterly and provides an annual report to the School Board. The first meeting of the Half-Cent Sales Surtax Citizens Advisory Committee was held on April 18th 2016. 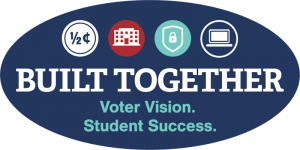 The School Board selected a committee of citizens, with relevant expertise, dedicated to assisting the School District in fulfilling the mandate from the St. Johns County voters. A committee chair, vice chair and secretary were selected. This committee meets quarterly to monitor the expenditures made using the half-cent sales surtax revenue. How Much Will a Half-Cent Cost You?